While no one can deny that the printing press is at the heart of every print shop, there are a multitude of print shop tools and supplies that are either incredibly helpful or downright necessary to a functioning shop. 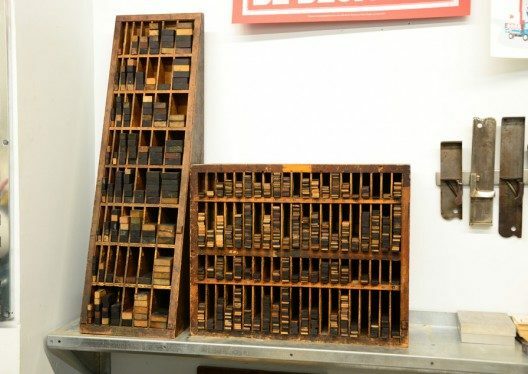 Some tools are “compositor’s tools,” useful for the person printing with handset wood and metal type. Most are applicable to both traditional and photopolymer letterpress printing setups. One of the most remarkable devices of all is the simple gauge pin. On the hand press, the function of keeping the paper in register was supplied by “points” on the tympan, which pierced the dampened paper easily and kept it from shifting. The point-holes on incunabula leaves can be useful bibliographical indicators. On the nineteenth century platen press, this function was filled at first by bent pins inserted into the tympan, or quads pasted on the tympan, to which the sheet of paper was fed. Soon more elaborate devices were made, culminating with several varieties of gauges that clamped to the tympan paper, made by the Edward L. Megill Co. of New York (and later Brooklyn). 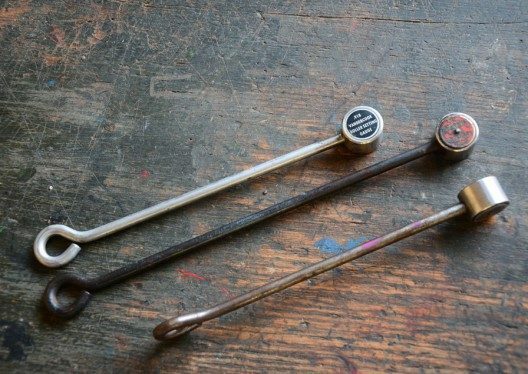 These patented gauge pins were in general use over 100 years ago. Today they are still made and sold; the gauges have not changed over the years. Megill pins include a sharp end that punctures your tympan, and a brass tongue and square end which holds the sheet. These come in a variety of specific styles but are all essentially the same. Higher-quality guides lock into the press on both ends with a lever system and are called Quad Guides (and are sold under the brand name Kort Adjustable Quad Guides). Take care when aligning your guides: a misplaced guide will easily crush type, a polymer plate, or damage a base. This usually breaks the pin or guide too. An alternative guide can be made using paper, cardboard, or sticky foam. Furniture is the wooden (or occasionally metal or resin-composite) blocks that surround your form or plate base to hold it in place. Furniture is absolutely necessary for every letterpress shop, and the more complete your set, the more versatile you will be. Cut to be shorter than type high, furniture comes in a standard series of lengths and widths. The sizes are measured in picas. Available widths are 2, 3, 4, 5, 6, 8, 10, and lengths include 10, 15, 20, 25, 30, 40, 50, 60. This means the smallest piece of furniture available is 2×10 picas, and the largest commonly available is 10×60 picas. Furniture is commonly stored in a wedge-shaped cabinet, housing 5 or 6 pieces per size, short at the top, long at the bottom, and narrow on the left to wide on the right. Since the width and height are nearly the same, 4 pica wide furniture will usually have a groove cut down the top side signifying which side faces up. Furniture is cut to exact measurements, and should all match perfectly. Old or neglected furniture may not lock up evenly or solidly. Reglets are also made of wood but are only available in 1/2 and 1-pica widths. Often used as “leading” or “spacing” for wood type, they are commonly cut to any length. The architectural word quoin, denoting an angular stone or wedge-shaped block, entered the language as a printing term in 1570. Quoins are a locking tool used to hold type or bases snug on the press bed. A minimum of two are needed to lock up a form, one for vertical hold, one for horizontal. For over 400 years quoins were short wooden wedges, used in multiples, that were driven with a ‘shooting stick’ and mallet against long tapered sticks called side and foot sticks, When the quoin was driven against the side or foot stick by taps from the mallet, they filled a wider space in the chase while still remaining parallel, and had the effect of locking the page of metal type into place. 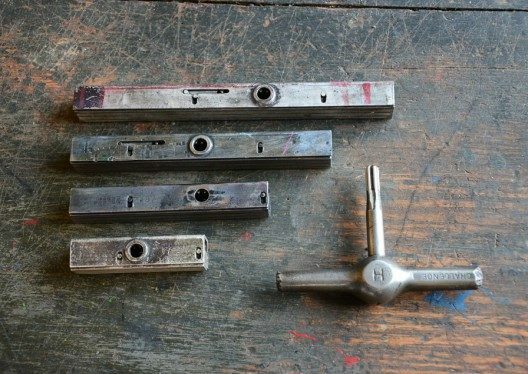 A tap or two with the shooting stick and mallet in the opposite direction would loosen the quoins and enable the compositor or pressman to make corrections in the form. Like most other appliances in printing, this simple device was changed in the second half of the nineteenth century. Mechanical quoins were invented; most were metal but they continued the use of pairs of wedges. 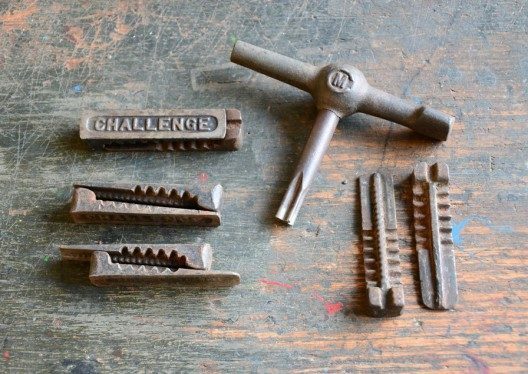 The most basic, the Hempel quoin, had teeth along the inside edges; by turning a toothed key, the wedges could be tightened without a mallet. Later improvements included enclosing the wedges in a metal casing and changing the tightening method. The highest development came with the invention of the “high-speed quoin,” where the amount of tightening pressure on the form can be calibrated and repeated. Wooden quoins continued to be used in pairs well into the twentieth century although they were becoming obsolete. The 1923 American Type Founders’ catalog still sold them by the barrel of 7500. Today it is rare to find any. Even rarer are the old “shooting sticks” used to transmit the force of the mallet to the wooden quoin. Although some are still around, they are mostly in the hands of collectors who consider them relics. Hempel quoins and keys are readily available on eBay and are common in most old shops. Hi-Speed quoins are still available new today but are more affordable when purchased used. Be sure to purchase a key that matches your quoins, as different series, styles, and sizes of quoins use different keys. This metal frame is used to hold type in place while printing, usually on a platen press. Type or a base is locked up towards the center of the chase using furniture to position it and quoins to apply pressure against the X and Y axis. Lock up is done on a composing stone to assure that type is level. Before quoins are tightened a planer is tapped gently on the type surface to confirm the feet are flush against the stone, completely level. Typically made of cast iron, the size of a chase matches a specific press. The measurements, in inches, of the inside of the chase are also used to describe the press size. (So an 8 x 12 C&P uses a chase that measures 8 x 12″ on the inside of the correct chase.) Some chases, especially large ones, have handles at the top to assist the printer in both transporting and placing the chase in position on the press. A spider chase is made for locking up small forms in a large chase by providing a small frame with “legs” that attach to the larger chase. Chases can also be useful with flatbed presses for a variety of situations. Composition of complex forms can be created on a composing stone in a large chase, then brought to the press before printing. Small chases are useful to create angled type in a flatbed press, easily locked up with triangular cut furniture and magnets. The Pantone Matching System is a standardized system of color for printers. If you do regular work with a designer, this is essential for matching colors long distance. The books come a variety of ways and you will most likely need the book for uncoated (matte) stock. Online retailers will have the best prices, and picky printers should replace their book every few years to be sure colors have not faded. A base is a milled block of either solid aluminum, aluminum with a magnetic face, or aluminum with embedded magnets. All work the same way, lifting an exposed polymer plate up to type high for printing. There are a few manufacturers around the country selling bases, and often, corresponding plates. Magnetic bases work with steel-backed plates, and non-magnetic bases work with sticky-backed plates. Bases can also be manufactured by a skilled machinist, but are probably not much cheaper than buying one from a regular retailer. Plates and bases come as a matching pair. Consult with your supplier for what is appropriate for you. Fabric is always better than paper when cleaning rollers. Rags can be anything from old t-shirts to painters rags from the hardware store to rags rented from a uniform company. These should be kept in a fire-proof container after use, and disposed of in a safe and responsible manner, depending on your state or country laws. If hung out to dry rags cease to be classified as hazardous waste and can be discarded safely. Consult your MSDS to best understand how to safely dispose of your chemicals. The rails on a platen press wear out with time, and it is sometimes necessary to add height to return rollers to type-high. Scotch or masking tape will work, as will aluminum duct tape, those these tapes deteriorate and their adhesive will eventually stick to trucks as they do so. Specialty retailers carry thicker teflon or plastic UHMW tape in a variety of widths which will work also. This is a metal tool that vaguely resembles a lollipop. One end has a metal cylinder which has a diameter of .918″ (type high), connected to a long handle. 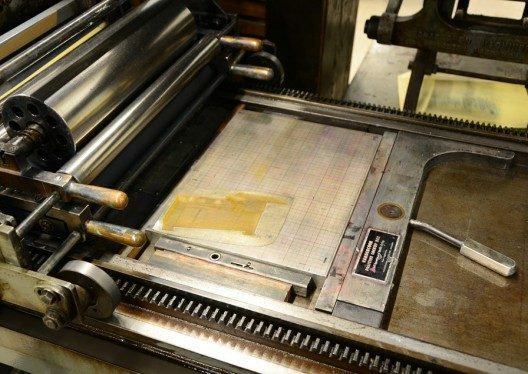 When slid along the bed of the press under inked rollers, a the width of stripe of ink left on the cylinder will signify the height of the rollers. Proper roller height will leave a mark approximately 1/16″ wide (~2mm, or the width of a nickel). No mark or a hairline mark shows that your rollers are too high. A wide mark shows that rollers are too low. When checking height, each roller should be checked on both sides of the press bed. Damaged rollers will produce skewed results. Take care when purchasing a roller gauge as some are produced for use on galley-height presses (.968″). These are .050″ wider than type-high, and are not useful for most presses. Gauges should be marked with the height on the side of the cylinder. This tool measures the height of a piece of type or a form and came in a variety of styles. The most common is a forked tool into which the type is placed. A set of marks scored into the gauge note type high. 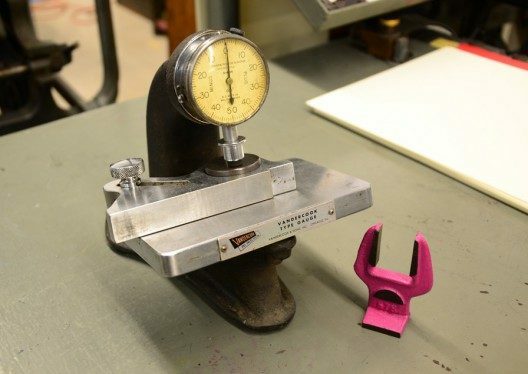 Like the roller gauge, this tool is very useful when troubleshooting problems on press and will help you eliminate issues.